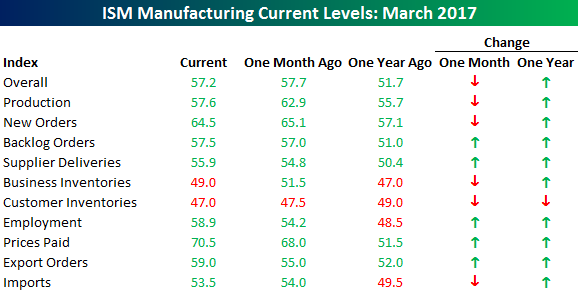 After hitting its highest level in over two years in February, ISM Manufacturing for March saw a modest pullback. Economists were expecting the headline reading to fall to 57.2 from last month’s reading of 57.7, and that is exactly where it came in. it will be interesting to see how the next few months play out from here because prior rallies in the ISM Manufacturing report throughout this cycle have all peaked around these levels. The table below lists the month/month and year/year changes for the ISM Manufacturing report and each of its components. Breadth was mixed this month as five components increased m/m and five declined. The biggest gainers were Employment, Export Orders, and Prices Paid. On the downside, Production saw the largest decline, but this came after it hit its highest level since March 2011 last month. On a y/y basis, breadth was much more positive as Customer Inventories is the only component that is down relative to last year. As mentioned above, Employment, Export Orders and Prices Paid saw the largest m/m increases this month. All three components have surged on a y/y basis as well. As shown in the charts below, Employment is currently at its highest level since April 2011, Prices Paid is at its loftiest level since May 2011, while Export Orders hasn’t been this strong since November 2013. The last time Employment surged more on a y/y basis was from August 2009 through August 2010. Want to see more? Start a two-week no obligation free trial to Bespoke’s premium research platform.